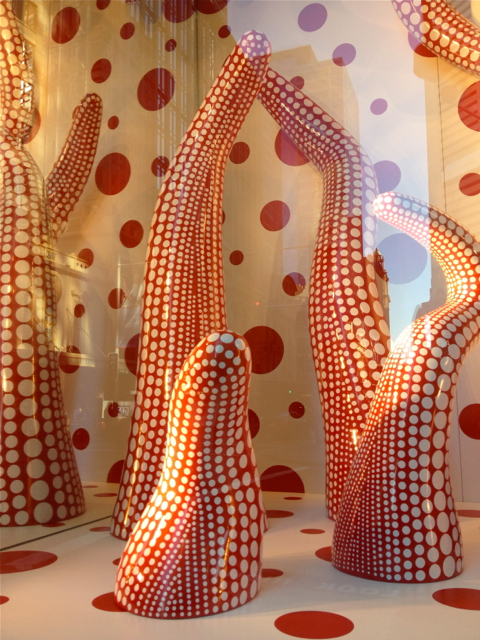 They're colourful, exuberant works by prolific Japanese octogenarian artist Yayoi Kusama. Earlier this year I visited an exhibition of her work in the wonderful Gallery of Modern Art in Brisbane where my grand-daughter and I had great fun sticking stickers in the Obliteration Room installation conceived by Kusama. 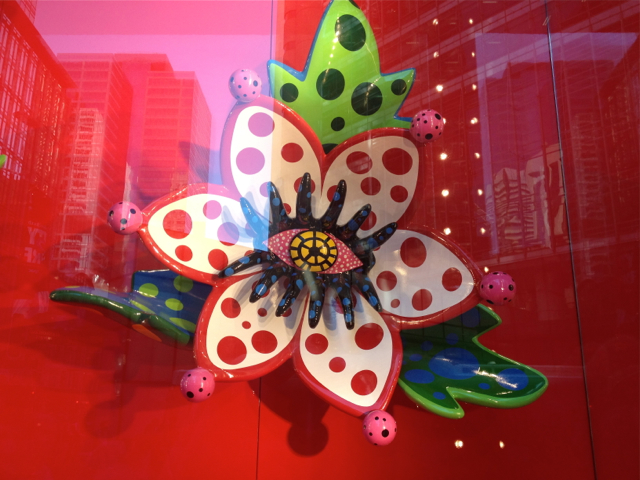 Kusama, who was integral to many of the experimental art movements of the 1960s, and has been continuously devising and executing her works since then, is very trendy just now. 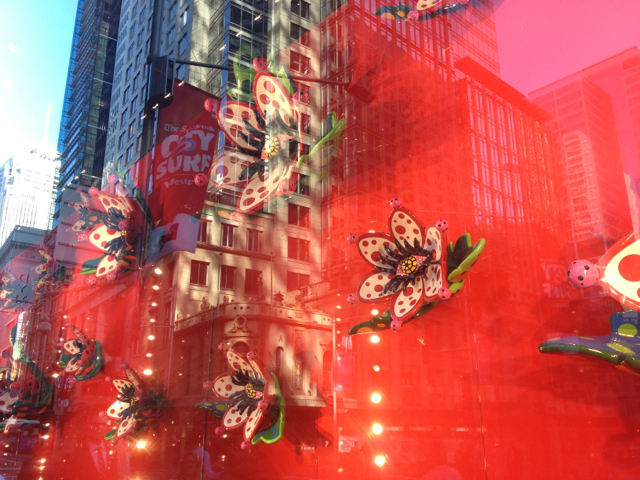 A current exhibition of her work at the Whitney Museum in New York has had people queuing around the block to view it. She has an obsession with dots and with gigantic life-like but not realistic forms that makes her work very playful and approachable. It was such a delight to see these works just there on George Street for passers-by to enjoy. 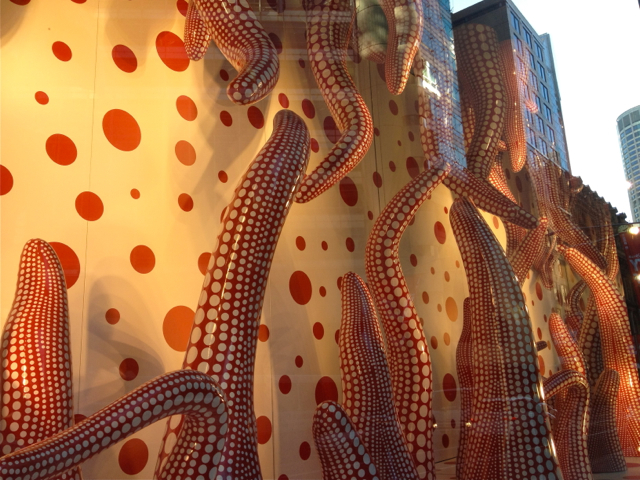 An added delight is the way the shop windows reflect the street and its buildings and integrate them with Kusama's works. Sydney can share this trend with New York. 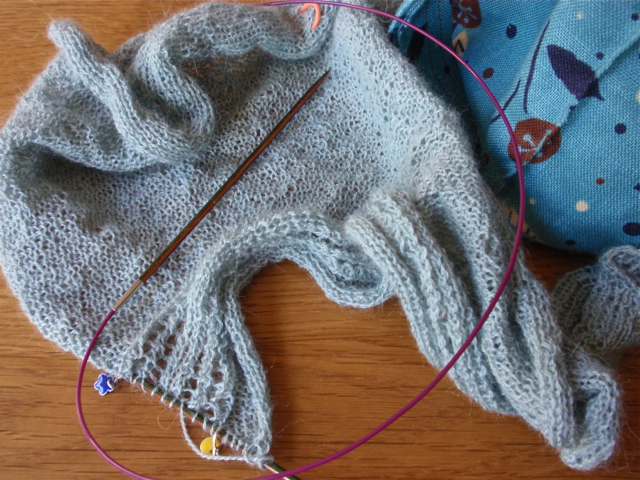 So many of my blogposts about knitting seem to be about changes of direction, distractions, abandoned or postponed projects. I rarely seem to get directly and unswervingly from the plan for a project to its outcome. This is another of those posts. Recently I started the Tour de France Knit-Along. You know the drill - you commit to a project, begin knitting as the Tour de France starts and then - if all goes well- you finish the project by the time the tour ends. The KAL gives you options - completing a major project within the duration of the Tour (yellow jersey), knitting a number of smaller projects (green jersey) or finishing off some incomplete knitting projects that have become major obstacles (polka-dot jersey). I opted for this last. I have two pieces I'd love to have completed - a sleeveless jumper and a kimono jacket - but I have knitters' block about finishing them. In the past the Tour de France has been quite successful in motivating my knitting, but this year, despite a promising initial effort, was a huge fail. A bit like Australian participation in the Tour de France, really. I had a major distraction. 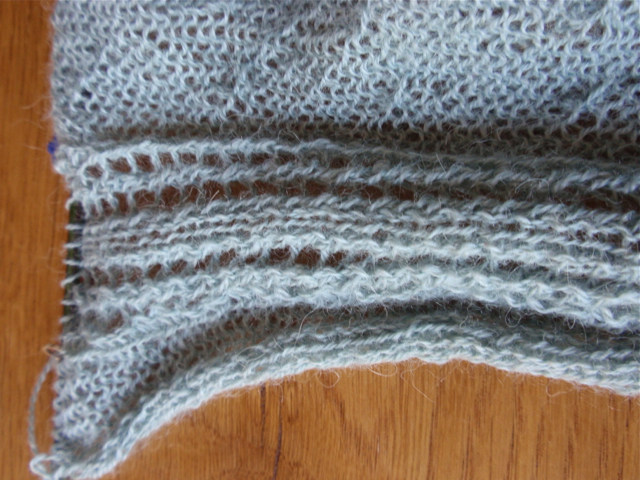 I saw the pattern for Miriam Felton's Rill scarf and just had to knit it. Immediately. I had some beautiful laceweight Wollmeise yarn, but it was still in its massive skein and I had no way at home to wind it into a manageable ball. So I went hunting in my yarn collection and discovered at the back of the yarn cupboard some Misti Alpaca laceweight of unidentifiable origin. I suspect I must have acquired it in a local destash because I liked the colour - a very soft blue/grey. So I cast on and began knitting. And continued. And continued. And am making slow but enjoyable progress. The yarn is extremely fine and the very thing I love about the pattern - its soft folds and drape - is achieved by knitting lots of short rows. In other words, you do lots of knitting to achieve not much advance in the scarf's length. I was finding my knitting very enjoyable until knitting group last Thursday evening. As happens so mysteriously yet frequently with knitting patterns, another member of the group was knitting the same scarf. Well, and this really was a shocking discovery, not quite the same scarf even though we were using the same pattern. Hers seemed to be a variation of birds' eye lace - a kind of netting pattern - while mine was a neat arrangement of yarn-overs and knit two togethers in a ladder-like arrangement. I discovered I had misread the pattern. It wasn't the kind of not-paying-attention that sometimes leads you to misread the pattern, but rather the agonising over the possible meanings of the instructions and choosing the wrong outcome kind of misreading. Before this discovery I'd loved the lacy detail of my version of the pattern. I liked its rather severe and neat geometry. But now I know I've 'done it wrong' I don't seem to be able to regard it in the same positive light. I know this is silly. 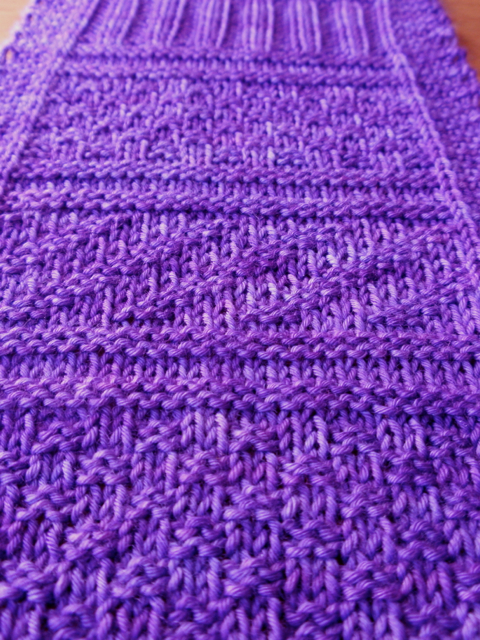 I have no intention of starting again with the 'proper' pattern because I can't bear to unravel what's already many hours of laceweight knitting. And anyway, I really do like it. I just wish I hadn't discovered it was 'wrong'. 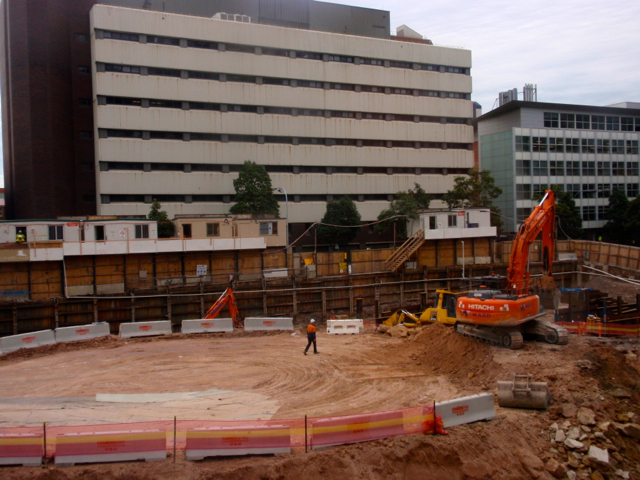 My daily Sydney seems to have transformed itself into a building site. I don't think Sydney in general is currently experiencing a growth spurt. Most of the statistics seem to report a lull, if not a downturn, in the building industry. So I can only conclude that most of the building that is being done, is being done around me (how's that for an egocentric view of the world?). 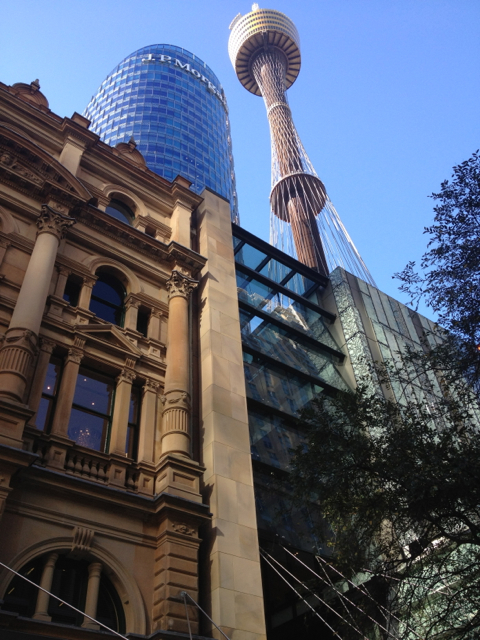 Over the last year or so this building inserted itself into the view from my living room window. 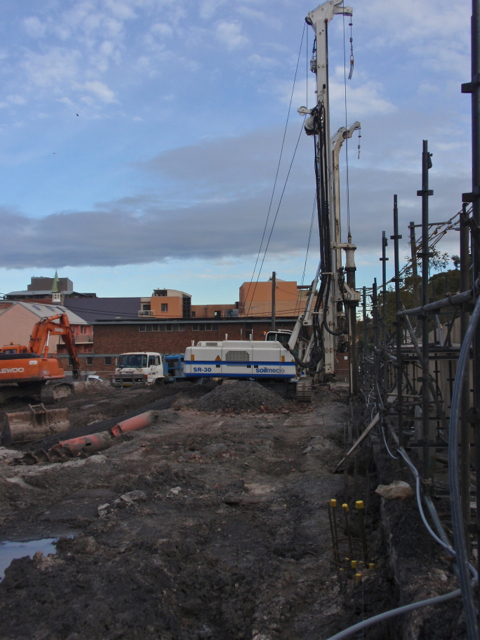 A hole in the ground that will become a second apartment block of similar height and design. I'm relieved that the pile-driving for the foundations, with its ear-shattering vibrations is finished, but I still have many more months of building activity to hear and observe. I wonder what impact, if any, these buildings will have on the neighbourhood. The area in which I live is already so densely trafficked and used for commuter parking that I can't imagine there will be a noticeable change in traffic patterns. My best hope is that the influx of new residents might actually improve shopping and restaurants - most of which are currently very utilitarian. 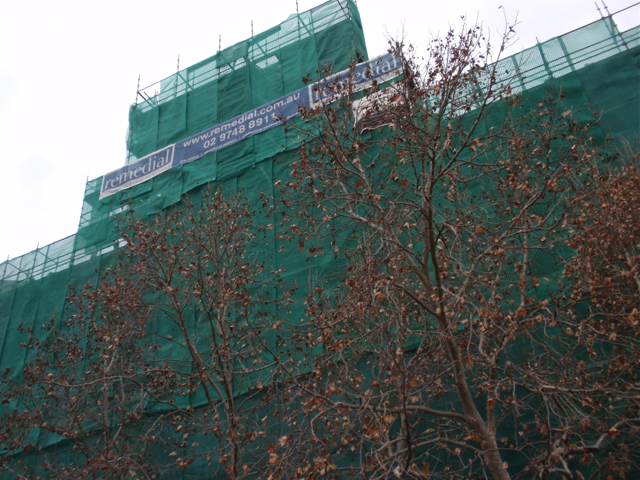 My in-need-of-repair apartment building is swathed in scaffolding like a Christo exhibit or an elderly aunt protecting her dress with an apron. The 110 year old fabric of the building is in need of patching, repairing, replacing and painting. We've already done the back of the building and are now working on the front. The sides will be done later in the year. At work it's more of the same. 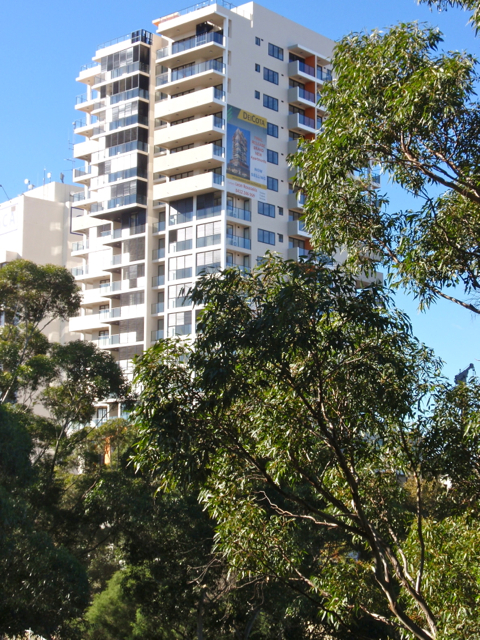 Tall apartments are rising on Broadway, opposite my office window. 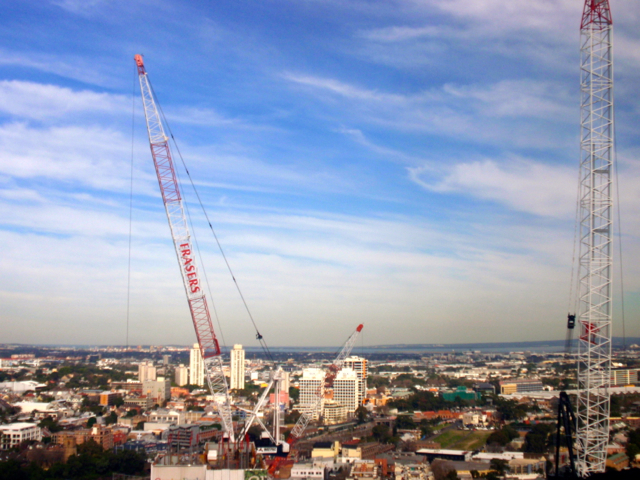 The construction has reached a stage where the cranes that top the structure are outside our twenty-seventh storey window. Most distracting. The cranes seem to dance with each other, and the assured delicacy with which the drivers lift and swing their cargo (sometimes workmen in crates) between the buildings is breathtaking. Exclamations of 'look what they're doing now!' have become commonplace in our office. By the way, the green splodge in the bottom right-hand third of this photo is the scaffolding on my apartment building. 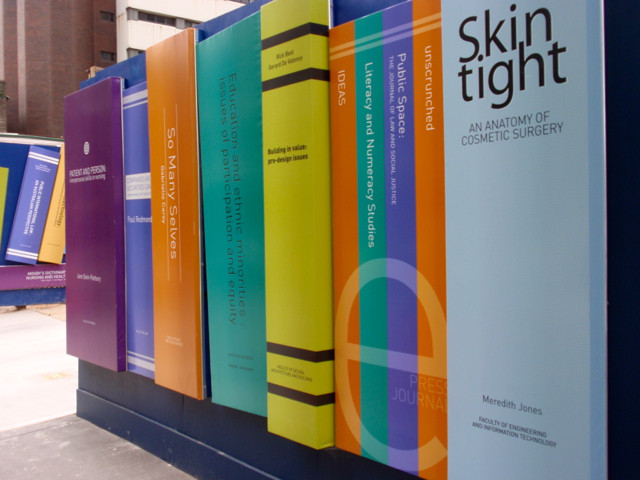 It's been painted with the colourful spines of books - real titles by real UTS academics. It always makes me smile as I pass by. See what I mean - construction everywhere. A transformation of my daily Sydney. 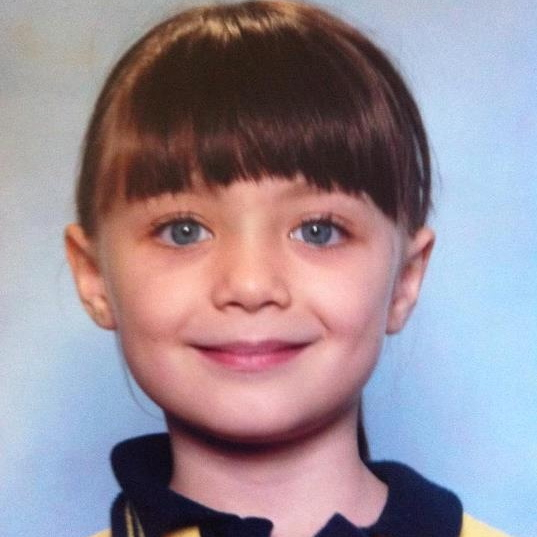 Neither of my two children look like me in the slightest. An uncanny resemblance, isn't it? My grand-daughter's hair and eye colouring are lighter than my daughter's, and I think this had distracted me from realising just how alike they are. 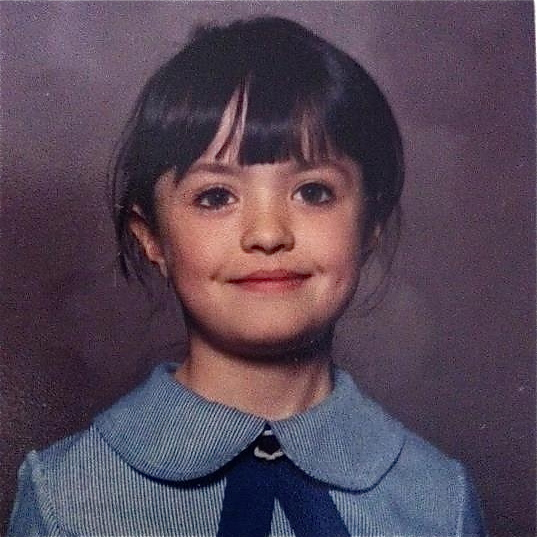 Discovering my daughter's old school photo was a revelation. I love these photographs. One of those reminders of connection across generations. 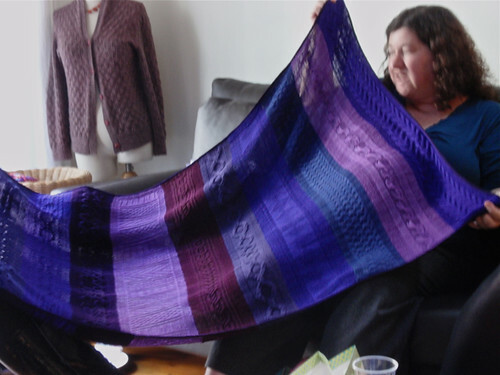 One of the unexpected outcomes of taking up knitting again in the last four or five years has been the friendship networks that have developed. Sociable knitting is undemanding. You can sit with a group of people who are knitting and chat. Or you can sit with a group of people who are knitting and just listen, if that's what you prefer. But if you meet up with the same people from time to time over a period of years you inevitably get to know and care about them - particularly if they are as open and sharing as the group of people with whom, in different combinations, and with variable degrees of regularity, I knit. This is all a lead-up to displaying a most wonderful group knitting project. A valued member of our informal knitting network is having a much anticipated and welcomed baby, which is due in a couple of weeks. Of course we had to knit a blanket to welcome the new baby. But it had to be a special blanket. There was much planning and discussion - squares? 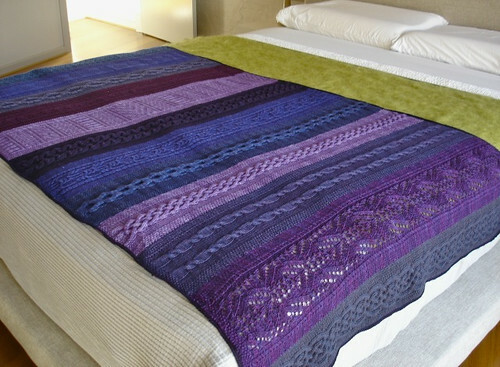 a big mitred blanket? All a bit ho-hum. Lots of to-ing and fro-ing later (this group of people is capable of producing email discussion threads more than 40 posts long) and inspired by a gift to Kate Davies of Needled fame, it was decided we would each knit a narrow strip - in a cable or gansey pattern - and, because our friend Jody has a passion for purple, and because she likes Wollmeise yarns, we agreed to knit it in shades of purple Wollmeise. This is one of those projects that shouldn't have worked; but did! 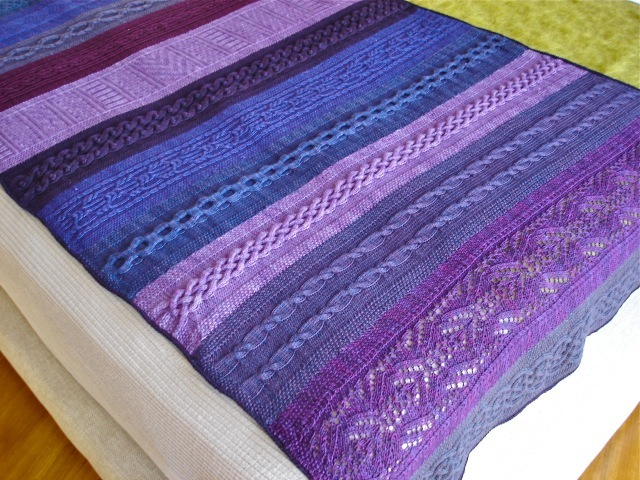 After masterly sewing up, blocking and edging by gifted members of the group, the outcome was wonderful. Yesterday we had afternoon tea with more cake and bubbles than anybody would have deemed possible and gave the blanket to Jody. I think she liked it. I loved the camaraderie and exchange and fun that went into making and giving this gift. I hope it was a great gift for Jody, but I know that along the way it gave the gift of knitting pleasure to all of us who participated. I'm not sure why I'm continuing to blog about book-buying when I'm so clearly not going to meet my target for the year. Maybe because I think it might at least limit my book-buying tendencies if I have to publicly acknowledge them? Possibly because it provides an opportunity to think about the patterns of my buying and reading? Or maybe just because I like writing about books. I was doing reasonably well for most of June. My love affair with the Kindle is continuing and I bought Jo Nesbo's Devil's Star (yet more and yet more Scandinavian crime fiction) and my book group's read for this month, Anna Funder's Miles Frankin prize-winning All That I Am. I'm not sure that the Kindle is an ideal medium for my book group reading. One of its shortcomings (yes, even such a fan as I am has to admit there are some) is that it's much harder to flip back and forth to reread bits and pieces and think about how they relate to each other. I guess over time I'll work out what format is best for what kind of reading. Wouldn't you love to be able to write lines like that? Like so many of my books, Heartburn somehow disappeared, so I've purchased a replacement. It wasn't available in e-book format, so this time I've bought a 'real' book. And mainly because I couldn't resist the title I also bought Ephron's book of essays I Feel Bad About My Neck: and Other Thoughts on Being a Woman. So that's four more books for this month - but so much reading pleasure.